Buying and selling a home can be a daunting task for anyone, especially when it is your first time. But, it’s a process you don’t have to go through alone – that’s where a real estate agent earns their weight in gold. When homebuyers and sellers work with an agent, the entire process runs smoother and is a lot less stressful than if buyers or sellers did everything on their own. Here are reasons why working with an agent matters. First, when looking at statistics (see the infographic below), most buyers and sellers rely on an agent. In fact, 87 percent of buyers bought their home using a real estate agent, and 88 percent of those buyers would use their agent again or recommend them to someone else. On the flip side, 89 percent of home sellers used an agent to sell their home, and in 2015, only 8 percent of homes were sold by owner, making that year the lowest share of For Sale by Owner (FSBO) sales recorded since 1981. The proof is in the pudding. Statistics also say that 48 percent of sellers who don’t use an agent will end up with a lower-than-expected selling price. On the flip side, homes listed by an agent will sell for an average of 18 percent more than if the owner sold it. If you’re in the tricky situation of looking for a house while selling your current home, then it is even more critical that you work with an agent. Not only will they list and market your current property, but they will also help you find your new home, greatly reducing the stress of a dual transaction. Let your agent be your liaison, and take advantage of their knowledge and skills. In the end, they will help you save time and unwanted frustration throughout the entire buying and selling process. 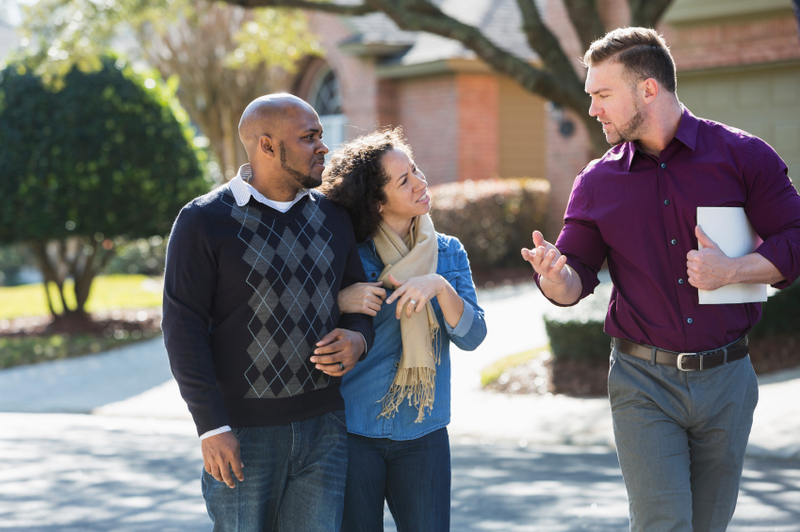 In addition, agents know more about neighborhoods than anyone could possibly discover on their own, including information about active and sold properties, prices, etc. If you are interested in new construction, then another bonus is that agents know the individual builders in the area. Having an agent who is knowledgeable in your desired neighborhood and one who knows the history and the state of the market is crucial and beneficial to buyers and sellers. Additionally, agents have access to a wide selection of homes that are not yet listed and visible to the public, giving you a leg up on other home searchers. By working with an agent, you have a broader range of options for potential properties and your home has the potential of being widely marketed. Home showings are one of the trickiest parts of buying and selling properties. An agent can show your listed property while you are away from the house, accommodating a larger audience of potential buyers. Conversely, in a for-sale-by-owner (FSBO) scenario, when sellers show their home without an agent, they are decreasing the chances of someone buying their home due to limited showing opportunity. Buyers want to have a run of the house when viewing a property without the sellers “breathing down their neck" or sharing in detail everything they have done to the house. So, if the property is listed with an agent, then they can schedule showings readily while the seller is not present, increasing the likelihood for showings and for a sale. Vice versa, the agent can schedule showings for you so you can visit multiple properties in as little as one afternoon. Ideally, you and your agent work as a team. It is your job to tell the agent what you want in a home, such as number of rooms, bathrooms, square footage, the neighborhood you desire to live in, etc. Then the agent goes to work, scheduling homes for you to see that meet your criteria. What you may not know is that agents have a fiduciary duty to you; they are ethically and legally-bound to represent your best and highest interest. Not only will an agent guide you step by step through the entire process of selling or buying so that nothing is missed or forgotten, but they will also help you understand the requirements and contract terms, without which your liability increases. Finalizing contract negotiations is another area where an agent’s expertise is beneficial to you as they make sure all the paperwork is completed in a timely manner and all contract points are addressed. This can be an emotionally stressful process and the agent is there to help by guiding you step by step from contract acceptance to close of escrow. Buying and selling a house is no easy task. Find an agent that you can trust and partner up with them for maximum advantage. My sister is looking for a house to buy. Thank you for explaining that real estate agents can help to negotiate contracts. I can imagine how helpful a real estate agent can be when it comes to making a contract and finding a house that is within your budget. Yes. Finding an agent to help you in the home buying or home selling process is beneficial for numerous reasons. Like you said, they bring the knowledge and guidance to the table that you otherwise wouldn’t have. Simply put, anyone who is trying to buy or sell a house should enlist in the help of an agent. Thanks for sharing! 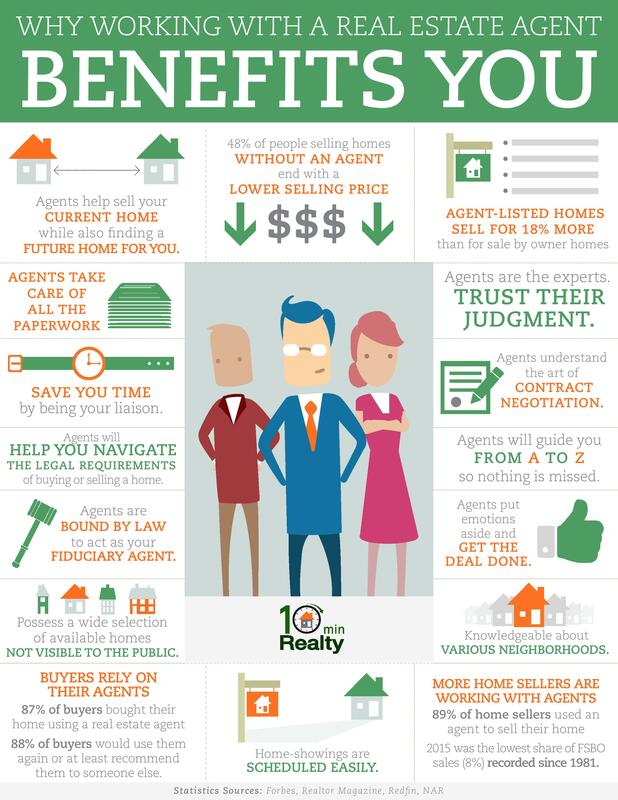 I appreciate this information about why working with a real estate agent benefits you. It is good to know that realtors can save you time. It would be good to know that they are accomplishing important tasks efficiently. Something to consider would be to find an agent who is familiar with the area in which you live. My husband and I are looking at both selling our current home and buying a new one. As you said, this can be quite a daunting task. I can definitely see how a realtor can help with this process. It is definitely nice to have someone that understands the legal process with all the paperwork! Thanks for sharing! It is good to knwo that real estate agents know more about neighborhoods than anyone could possible discover on their own. Being aware of sold properties and prices would be beneficial. Another thing to check for would be to find a realtor with excellent communication skills to ensure your questions get answered as they arise. My sister’s husband just got a new job which means they will have to move soon. It is good to know that agents know more about neighborhoods than anyone could possibly discover on their own. It would be good to know about active and sold properties and their prices. I will advise my sister to hire a realtor, thanks. That’s a good point you make that you don’t have to be at the showing when you have a real estate agent. My husband and I want to sell our current home so that we can move in with his grandparents and help them out because his grandpa has Alzheimer’s, and it’s just hard. We’ll have to find ourselves a real estate agent to make everything easier for us. It’s not only about buying and selling that requires an agent. Agents are really helpful when it comes to letting property. Whether you are a landlord looking to rent your property or a tenant searching for properties, letting agents can always be great help and can save a lot of time and efforts. I believe that agents are really very helpful in buying or selling a home. They are professionally trained and know how to market a house. I am a broker, and the graphic states that 48% of sellers who don’t use an agent sell for a lower price …. which means 52%, more than half, sell without an agent for a higher price. Plus they save the commission…. not good for my industry. My sister is planning to buy a home soon and she is thinking about hiring a real estate agent to help her choose the best home for a good price. You make a great point that a real estate agent will take care of all of the paperwork and they understand how to do contract negotiation. Not only will this save my sister a lot of time, but it will help her to stay relaxed and not get stressed out during the buying process. The benefits of working with a real estate agent are nicely explained in words and graphically. But how to find a right real estate agent for you? You can hire a perfect real estate agent by searching them online and reading their reviews, getting a recommendation from family members, colleagues, friends, etc., personally meeting them before cracking the deal, their experience and expertise in the industry and much more. Very interesting article. I love the infographic! A real estate agent can be very helpful for buying or selling your home, so you need to know what to look for when picking one. I particularly like that the article brings up a committed agent as one of the better qualities. After all, you want to make sure that the agent you hire dedicates all of their effort to helping you with your sale. A real estate agent can help you determine exactly what you’re looking for and then truly bring your dream home to light. Thanks for this great blog! I love your infopgraphic…. is there any way I can get permission to share this on Facebook or Instagram? Great Post,while buying home contacting estate agent is a important it saves money,as well as makes process as simple as possible.Contacting estate agent can more helpful for buyers.